The highly anticipated Champions League round of 16 tie Bayern vs Besiktas ended with the Rekordmeister dismantling the Turkish champions 5-0 opening the door for the Germans to advance to the next round. Thomas Müller and Robert Lewandowski scored two goals each. Bayern have now scored 15 goals in three games at this stage of the competition. The Rekordmeister can now plan for the next round of the competition. It was a cautious start by Bayern München with Besitkas pressing high looking for an early advantage. Bayern, however, had the first chances of the game. Thomas Müller’s header after a David Alaba cross in the sixth minute missed the goal, Robert Lewandowski let one fly just outside the box in the ninth minute with goalkeeper Fabri spilling ball, but Joshua Kimmich was having his rebound blocked. One minute later Arturo Vidal’s header just missed the target after a Kimmich freekick, and in the 14th minute, Müller missed the net again with another header after Kingsley Coman cross. Besiktas were struggling, and in the 16th minute, Besiktas were down a man after Domagoj Vida brought down Lewandowski outside the box. The Croatian defender was the last man and was rightfully sent off with a straight red card. James Rodríguez floated the ensuing free-kick just outside the far post of Fabri’s goal. In the 18th minute, Besiktas had their first chance of the game after Vagner Love escaped Bayern’s defence and went one-on-one with Sven Ulreich only to sent the ball wide over Bayern’s goal. 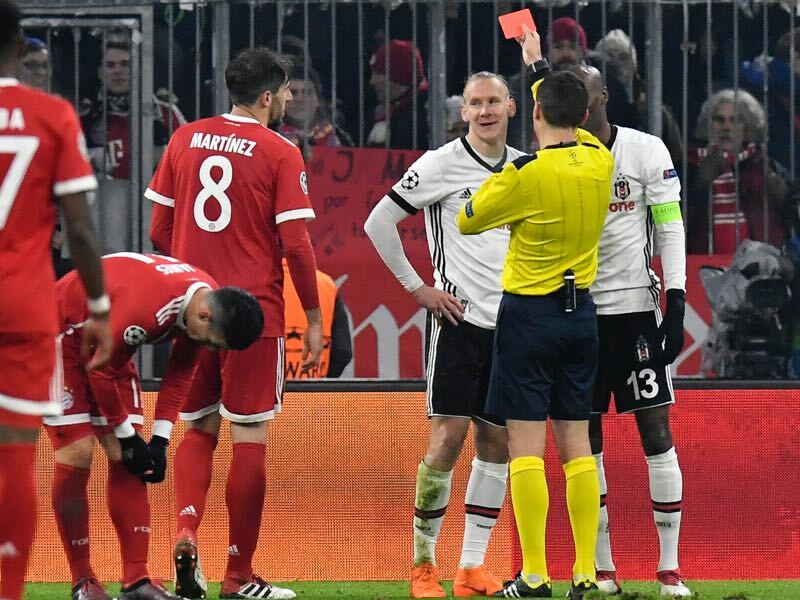 As a result of the red card, Besiktas dropped deep trying to absorb the pressure, and the Turkish side did well to keep Bayern out. The Bavarians piled on the pressure, and in the 30th minute Lewandowski appeared to have scored when a ball reached him inside the six-yard box, but his thunderous header was cleared off the line by Fabri, and in the 33rd minute Bayern had a shot by Alaba blocked off inside the six-yard box after Kimmich floated in a freekick from outside the box. With five minutes to go in the half Besiktas, all of a sudden started pressing up further the field, and Bayern made the most of the extra room to find the first goal of the game finally. Kingsley Coman played the ball in with a low cross inside the box that found Alaba, who laid off the ball to Müller and the German national team player made no mistake to score inside the six-yard box. The second half started with a bang! Brought down just outside the penalty box Lewandowski executed the freekick himself and hit the outside of the post. It was the beginning of an onslaught by Bayern with the Rekordmeister being up by two goals just a few minutes later. 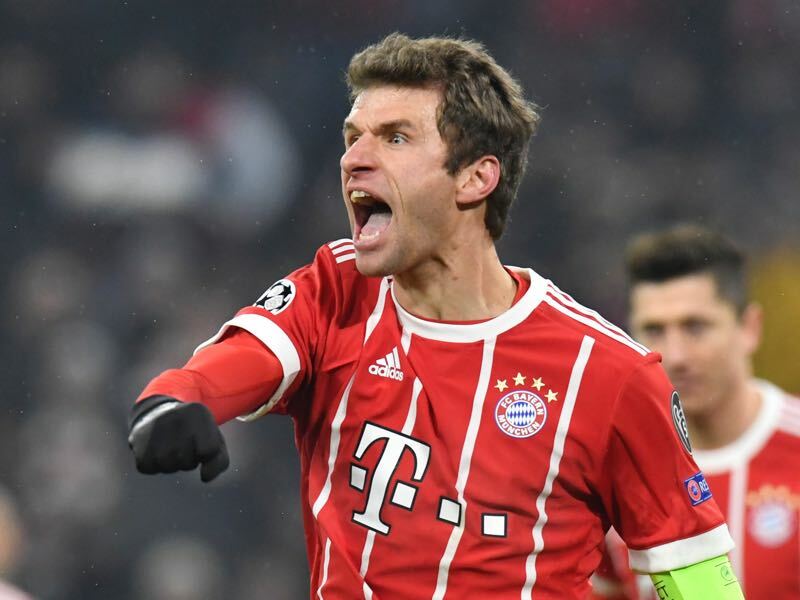 Müller unleashed Lewandowski for a deep run into the box with the Polish forward crossing the ball back from the byline finding an unmarked Coman just outside the six-yard-box, and the French attacking midfielder made no mistake to make it 2-0 in the 53rd minute. Following the goal, Bayern went somewhat on cruise control probing and testing Besiktas’ backline without risking too much going forward. It turns out that approach was enough and in the 66th minute, Bayern added a third goal with Kimmich crossing the ball from the byline inside the six-yard-box where Müller was left wide open, easily scoring with a volley that hit Fabri and went into the goal. Müller was then quickly looking for the hattrick, and in the 67th minute he just missed the net after another cross from the byline, this time by Robben, and in the 70th minute, Müller headed a ball over the goal from 12-yards out. In the end, it would be Lewandowski, who would get Bayern’s fourth goal. Moving up the field Mats Hummels drove the ball on Besiktas’ net from just 25-yards out, Fabri dropped the ball, and Lewandowski put away the rebound to score Bayern’s fourth goal. With just moments to go Lewandowski put the tie to bed by scoring his second of the night and Bayern’s fifth after receiving a beautiful pass from Müller inside the six-yard box. With Bayern up 5-0, there is now little doubt that the Bavarians are through to the next round. Thomas Müller was the man of the match. The German national team player continues his renaissance under head coach Jupp Heynckes. The forward terrorised Besiktas’ backline and could have had three or four goals. In the end, he scored two goals and one assist, and on current form, Müller will be a crucial player for the German national team this summer in Russia as well. Bayern love playing at this stage of the Champions League competition. The Bavarians have been rampant no matter who they have faced in the round of 16. However, a point could be made that Besiktas would have offered stiffer competition without the red card to Vida in the first half. But the Croatian was late in his challenge and breaking away just outside the 18-yard box Lewandowski would have surely scored. Kingsley Coman has scored two goals in his last three Champions League games, as many as in his first 15. Bayern scored at least two goals in each of the last eight competitive games in 2018. Bayern have now scored 15 goals in their last three games at this stage of the competition.